Curves to Kill...: Charles My Love!! Charles of London, an Independent Rock'n'Roll clothing label. I stumbled across Charles of London's webstore by chance one day and feel in love with the rock'n'roll/punk styling and wild fabrics used through out the designs. They sell women clothing, menswear and a whole heap of unique accessories. Deep down not matter how often I change my look or clothing styles I am always going to be alternative and I'll always go back to my rock chick roots. Charles of London is perfect for bringing out that side of me. I wanted to show and review my two favorite piece available via the webstore. Words alone cannot describe just how much I adore this jacket. I'm a huge fan of item of clothing featuring the union jack so when I saw this print it had to be mine. With a huge iron on transfer image and swarovski diamante detail it is the most awesome jacket I've ever owned! How perfectly does my new GMK cuff go with this outfit? This cuff rocks! It's strong, very rock'n'roll and is large enough to be an awesome statement piece. Although you can't get this specific design as they are all unique you can find so many brilliant items on line now. Before the year is through I need two more cuffs, a smaller every day cuff and another statement piece! 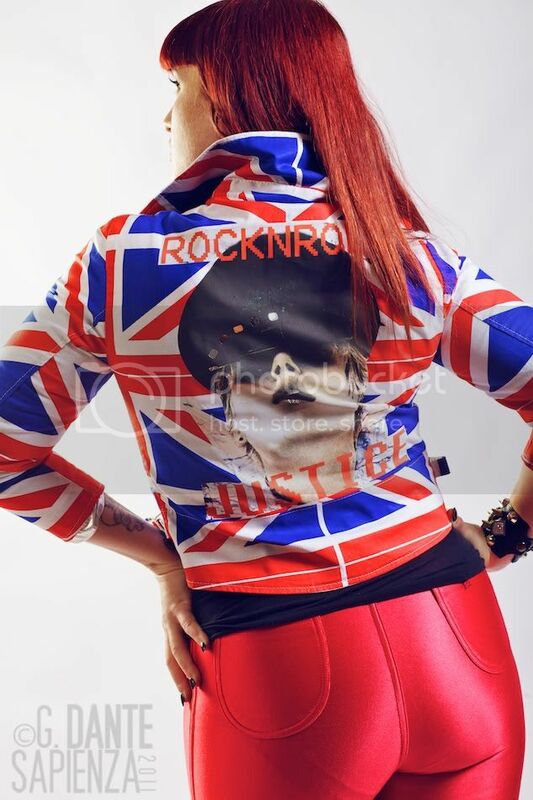 So as the site states this jacket rocks HARD! I'm wearing this biker jacket in a size L which works perfectly for my measurements (always listed at the top of the blog). It fits snug just the way I think a biker jacket should fit and hits my belly button/waist like for a cropped length. Paired with my bright red Disco Pants from American Apparel and blue wedges from Luichiny. I love the overly matched colours in this outfit and each matches perfectly with the red and blue in the jacket. I've also got a pair of Disco Pants that would look great with this outfit but I will blog about them at another point. Disco pants are brilliant I'd wear them 24/7 if I could. These Luichiny Pumps are so high yet so comfy and the colour is perfect for colour blocking or just adding a bright pop of colour to an outfit. The wedge and base make for a very comfortable shoe but I'm not game to wear these out dancing just in case I trip over myself as I do most days. These will feature in two more shoots/posts as I'm matching them with everything at the moment! Back view of the jacket. If you know me well you know I absolutely adore Frankenstein. I'm not sure what appeals to me about this big green dopey monster but I love him to death. I'm wearing this little mini dress which was originally a higher neckline but I requested something low cut and this was the result. A very funky zipper (not functional) edge around the bust. I am wearing a size L in this design also. The style is rather short on me but with my assets most minis become extra minis so I'm use to the length. This monster and silver paint fabric is exclusive to Charles of London and comes in other styles and clothing options. Teamed up with my Spliced Pleather Jacket from City Chic and my Simply Be Stockings £16.00 I chose the black jacket and stockings as I wanted the dress to be the main feature and I think it goes well. Sadly my stockings after only one wear met their maker after having a run in with a piece of Velcro. These stockings are stunning so I'm very sad to see them go. Unsure of sizes? You can email the lovely people behind this label via the contact page and they will answer all your questions. Thank you once again to the uber brilliant Giuseppe Dante Sapienza Photography for working with me! If you are local and you'd like to add to your folio or even just book a fantastic shoot get in touch with Dante via his website or facebook. He is so much fun to shoot with I love days when I get to pop into his studio! Both outfits are amazing, but the first one is so glam I can't help but love it more! That cuff suits it to a T. Ack, now I'm considering getting a pair of disco pants. Che Foto, Che Curve, che Carisma, che Pin-up! What a Killing Curvy Look . . .Cheers! I love the disco pants and monster dress, I wish I could pull off these looks! I love monster stuff and have deep rock chic roots too. You look great. Good lord I think I died for a minute. The combo of the Union Jack jacket and your hotness. Wow. I was OBSESSED with Union Jacks in high school, I loved the UK, so I had shirts, boxer shorts, flags, all with the Union Jack. That jacket speaks to inner teen! I love it so!